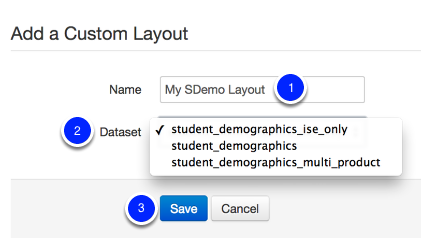 This lesson will guide you through the customization of your Student Demographics page. This page can be customized to see just information pertinent to your role. This feature is permission based- if you want to turn on the Page Customization for Demographics, there are two permissions. One is Administrative- 'Administrative Customization' and the other is for the individual user-'Self-Customization'. 1. Search for a student by using either the Search icon in your system navigation or by clicking the Students tab and selecting Search 2.0. 2. Once you select a student, you will be directed to the Student Demographic Details page. It is set to the default view. To customize what you see on this page, click Manage Layouts at the top of the page. Once you land on the Page Customization List, you will see the default view listed as 'Student Demographics-default', to create your own, select Create New. 1. Give your Custom Layout a Name. 1. You will start with one block (The black bars indicate Blocks) of information to customize. You can name it whatever you chose. To this you can add multiple Rows (The grey bars indicate Rows) of information. An "X" indicates the field can be removed from the demographics layout. Green coloration indicates the fields could be edited for students on the demographics page. 2. To add demographic information you want to see in your block/row, simply click and hold your mouse button on a piece of information in the right hand column titled 'Available Fields'. Drag this piece of information to the row you want it to be placed in. Note: You can re-order in the information in your rows by clicking and holding that piece of information (ex. Birth Date) and moving it to another spot in that row. 3. + Row= Add a row to that Block, + Block= Add a Block of information to your page, + Special Block= This gives you a default block for contact information. 4. Share- You have the ability to share this layout with other users. Copy- You can copy this layout and add/edit it. Delete- Delete this layout. 5. Click Save Changes. You layout has now been saved and you will be able to chose to use this layout as default. 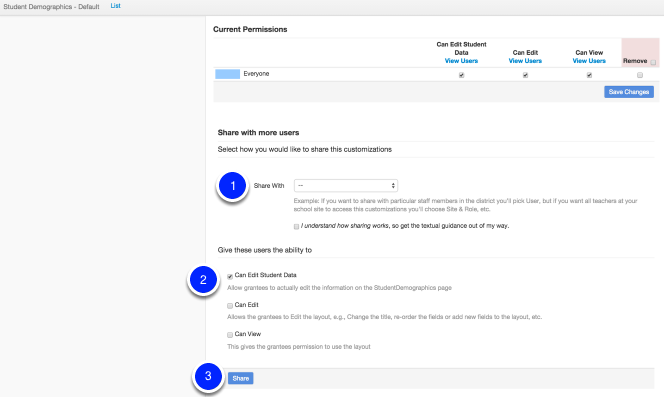 Sharing on the Student Demographics layout page allows District Administrators to set viewing and edit permissions and allow them to grant user permissions to edit student data on Student Demographics page. On the layout edit screen, there is a Share button that opens to new layout sharing page. 1. Chose who you would like to share this layout with. 2. Chose what abilities these users will have on the custom layout: Can Edit Student Data, Can Edit, Can View. Access a student via the search bar or Students > Search 2.0. 1. Click Select Layout once on the Student Demographics Details page, and select which layout you want to view. The page will refresh to reflect your customizations. Every student you access Student Demographic Details for will be defaulted to this view.